These were some of the comments from objectors to T-Mobile and Sprint’s desire to merge the two wireless carriers into one. Consumer and industry groups filed comments largely opposed to the merger on the grounds it would be anti-competitive and lead to dramatic price increases for U.S. consumers facing a consolidated market of just three national wireless carriers. Free Press submitted more than 6,000 signatures from a consumer petition opposed to the merger. “This is like a bad recurring dream,” one of the comments said, reflecting on AT&T’s attempt to acquire T-Mobile in 2011. The comments reflected consumer views that mergers in the telecom industry reduce choice and raise prices. The group found the alleged merger benefits offered by the two companies unconvincing. A filing from the groups Common Cause, Consumers Union, New America’s Open Technology Institute, Public Knowledge and Writers Guild of America West essentially agreed with the American Antitrust Institute’s findings, noting removing two market disruptive competitors by combining them into one would hurt novel wireless plans that are unlikely to be introduced by companies going forward. Rivals, especially AT&T and Verizon, have remained silent about the merger. 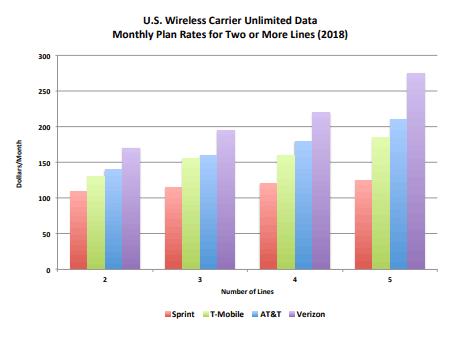 That is not surprising, considering T-Mobile and Sprint have forced the two larger providers to match innovative service plans, bring back unlimited data, and reduce prices. A combined T-Mobile and Sprint would likely reduce competitive pressure and allow T-Mobile to comfortably charge nearly identical prices that AT&T and Verizon charge their customers. Smaller competitors are concerned. Rural areas have been largely ignored by T-Mobile, and Sprint’s modestly better rural coverage has resulted in affordable roaming arrangements with independent wireless companies. Sprint has favored reciprocal roaming agreements, allowing customers of independent carriers to roam on Sprint’s network and Sprint customers to roam on rural wireless networks. T-Mobile only permits rural customers to roam on its networks, while T-Mobile customers are locked out, to keep roaming costs low. Groups like NTCA and the Rural Wireless Association shared concerns that the merger could leave rural customers at a major disadvantage. Many Wall Street analysts that witnessed the AT&T/T-Mobile merger flop are skeptical that regulators will allow the Sprint and T-Mobile merger to proceed. The risk of further consolidating the wireless industry, particularly after seeing T-Mobile’s newly aggressive competitive stance after the AT&T merger was declared dead, seems to prove opponents’ contentions that only competition will keep prices reasonable. 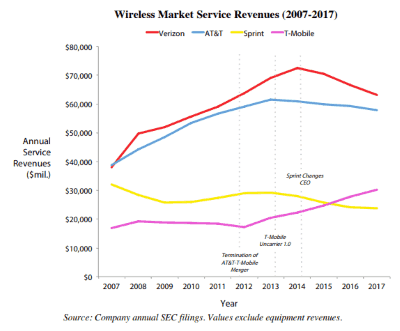 Removing one of the two fiercest competitors in the wireless market could be a tragic mistake that would impact prices for a decade or more. In 2002, there were seven national wireless carriers in the U.S.: AT&T, Verizon, Sprint, T-Mobile, Nextel, AllTel, and Cingular. In a consolidation spree that began in 2004, Cingular acquired AT&T. This was followed by Sprint’s acquisition of Nextel in 2005—a merger that has been called one of the “worst acquisitions ever.” At the time of the merger, Sprint and Nextel operated parallel networks using different technologies and maintained separate branding after the deal was consummated. The company lost millions of subscribers and revenue in subsequent years in the wake of this costly and confused strategy. In 2009, Verizon bought All-Tel. This was followed by AT&T’s unsuccessful attempt to buy T-Mobile in 2011 and T-Mobile’s successful acquisition of mobile virtual network operator (MVNO) Metro PCS. The DOJ and the FCC forced the abandonment of the AT&T-T-Mobile deal. 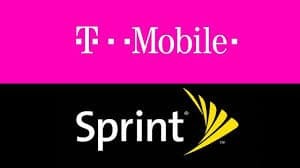 Like Sprint-T-Mobile, it was also a 4-3 merger that would have eliminated T-Mobile, a smaller, efficient, and innovative player that set the industry bar high for the remaining rivals. I am against the T-mobile/Sprint merger for only one reason: Concentration of the limited, highly government controlled, Radio Spectrum in the hands of Three Players, rather than Four Players with National Footprints. If one could contact the government, tomorrow, and simply acquire Bandwidth on a national scale similar to any of the BIG FOUR, I’d agree the Sprint/T-mobile merger could move forward. Then, at least a fourth or fifth player could enter the market if the newly created BIG THREE exhibited pricing abuse related to their oligopoly power.